I wrote this review as I looked at several inches of snow (and falling) outside my window. Perfect! A small child enjoys the wonders of the snow. In first person narrative, they get dressed, grab their sled, and enter the snowy world. They build snowballs and find icicles, ride their sled in an exuberance of delight, and finally, wet and cold, return home. The wonderful day ends with warm cocoa. The simple text captures the beauty and excitement of snow for a small child, the thrill of sledding, and the exploration of a frozen world. Saito’s art is not my usual preference, being more conceptual and splashy, with few to no lines, but it caught my interest and I fell in love. Against the white background are colorful splashes of rich, textured color. The child’s hat, the yellow sled, splashes of red and pink berries on the snow, and the child’s green coat and pink cheeks. 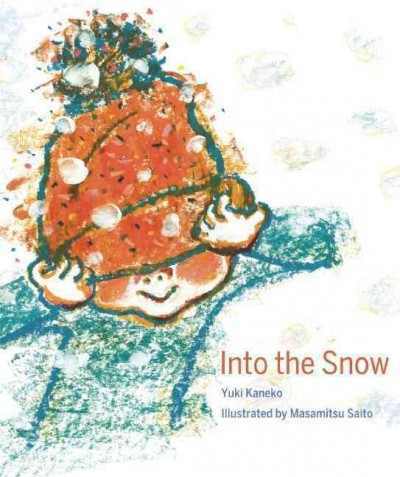 Movement of the child and snow are shown in swirling lines of color and splashes of white snow. Verdict: This isn’t your typical snow and seasons book. A small child’s delight in the snow is perfectly captured in stunning art and simple text. Perfect for toddler and preschool storytimes, to spur conversations about snow, and inspire children to paint their own snow masterpieces. Recommended. This book is full of sea otters. Squeeee!!! Ok, now that we've gotten that out of the way, it's also full of fascinating science! 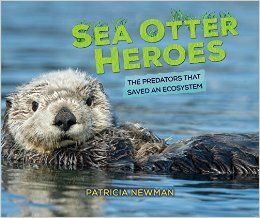 Newman explores sea otters, seagrass, and the scientific method through the research of marine biologist Brent Hughes. After introducing the basics of the scientific method, the extreme cuteness of sea otters, and the place where the research is centered, Newman follows Hughes' investigations step by step. The main narrative is Hughes' investigation of the unusual healthiness of the seagrass in Elkhorn Slough. One by one, he tests out different theories until he discovers the secret - sea otters! There's more than just a simple retelling of a scientific experiment here though; the history of pollution and treatment of sea otters, information about the various creatures that live in the area, and pivotal questions about environmental concerns are all included in this fascinating science mystery. Back matter includes activities like creating your own science experiments, discussion of ways to be involved in environmental cleanup and studying varying viewpoints on environmental issues, source notes, glossary, and bibliography. I love the Scientists in the Field series, but they're often too difficult for my lower level readers who are interested in science. This book hits a great in-between point between beginning readers and those who are more fluent. It's accessible and challenging, an interesting topic, and also includes practical applications for kids to explore their own science. Verdict: This is a great read on its own, but I can also see so many applications for it; it fits in well with our new curriculum requirements in the school district, would make a great book club choice, and also fit in with a science program or some of the garden programs we're planning for the future. Highly recommended. Yes, I only spent one day at the library this week. I took Monday - Thursday off and left my awesome staff in charge of Lego Club, storytimes, Winter Wigglers, and with lengthy instructions for the huge number of holds for remote collections that were coming in while I was gone. I would like to say I did something exciting on my vacation but actually I mostly slept, listening to Kerry Greenwood audiobooks, and read old mysteries and trashy romance. Oh, and weeded my personal paperback collection and binge watched Rocky and Bullwinkle. I did get a lot of reviews written, mostly on Flying off my Bookshelf, worked on several articles I'm writing, read books for later review, put together some pictures and jewelry, and finished all the work for my two online classes. Friday I had the Storyroom open all day for Craft-o-Rama, we had a staff meeting, I wrote up my section of the newsletter, cleaned off my desk, requested materials for more remote requests, book clubs, and next month's outreach, and worked on the teen comics/magazines. This is pure snark from beginning to end. A hyperactive wolf has decided he doesn’t want to be a bad guy anymore and he collects some other famous villains; a great white shark, rattlesnake, and piranha to form a club to do Good Deeds. 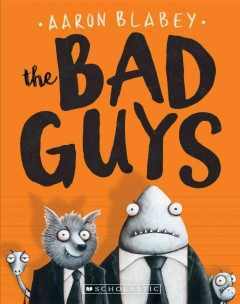 It’s an uphill struggle, first to rescue a kitten and then dogs from the pound, but the Bad Guys eventually decide they are up for this Good Deeds stuff, in their own, sharp-toothed, style. Black and white pencil sketches fill this beginning chapter graphic novel with partially-eaten rap sheets for the various characters and their distinct personalities. Beginning with Mr. Wolf’s manic enthusiasm, the story introduces cool, sardonic Mr. Snake, sinister Mr. Piranha, and dim but volatile Mr. Shark. Their bulbous eyes and toothy smiles bring out the personality of each and readers will giggle along as the club starts out in their classic car, looking cool, and searching for good deeds to do. Verdict: Hilarious fun. If you really wanted to you could parlay it into a lesson about not judging by appearances, but since none of the creatures are exactly innocent…. It’s probably better not to. 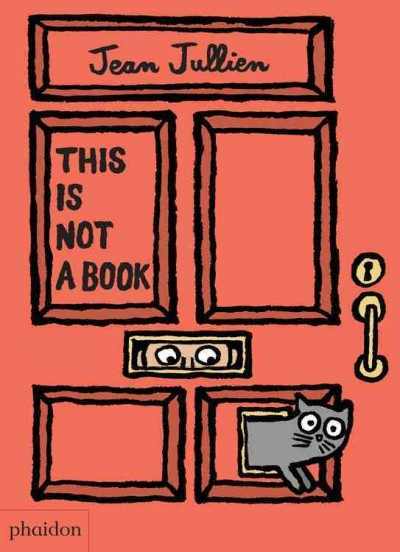 Just enjoy the snark and share it with readers who like the wit and humor of Mac Barnett and Jon Klassen. I won’t be adding this until next year, as I only purchase new beginning chapter paperbacks in January, but it’s definitely on my list for 2018. I don't like to admit how long it's been since I really got into a good middle grade novel. I have been focusing on nonfiction and younger titles for a long time and nothing seemed to grab me. However, I'm coming to the end of selections for my middle grade book club that I've read and I determined to try some things. I went through several and still didn't get into them and then I picked up this one and fell right into it. Sophie (which is an awesome book name - my book club readers have been quite vocal on "weird" book names) doesn't dream. What makes this even more frustrating is that she's surrounded by dreams. One illicit venture into her parents' dream shop and she acquires a companion - Monster. Life continues after this brief adventure, hiding from normal people, distributing dream catchers at school to collect nightmares, but then Sophie is seen by a client and the next thing she knows she's on a desperate venture to save her parents from the mysterious Mr. Nightmare. 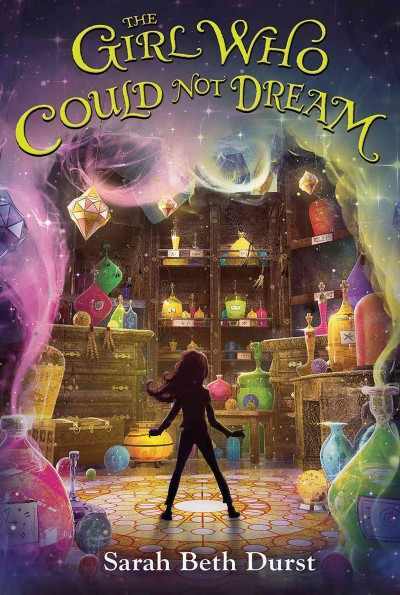 Can Sophie use her talent to make dream creatures real to avert tragedy or will everything be devoured by nightmares? 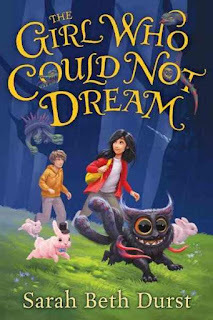 Sarah Beth Durst is an excellent wordsmith and she creates a tapestry of magic, humor, and fear, catching Sophie's emotions and Monster's personality, the chilling flavor of nightmares, and the wonder of the dream shop in her net. 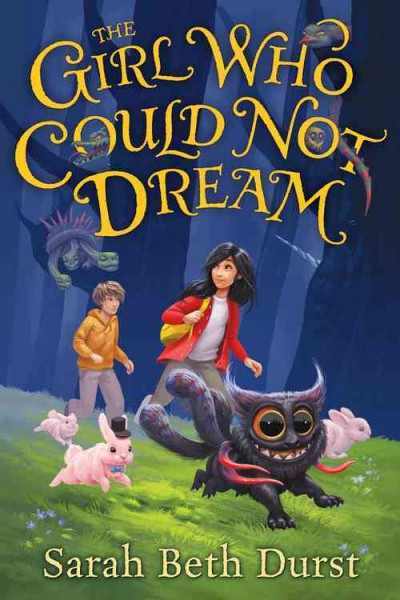 This is a pure comfort read, with plenty of fantastical details to light the imagination and intrigue the mind and a satisfying ending with just a hint of unresolved plots to keep the reader dreaming. Verdict: I like the paperback cover (pictured to the right) better than the original and I look forward to introducing this to my fantasy fans and my book club. This board book is super simple and yet, that's just what I look for when filling my shelves for the youngest of my patrons. Each spread features a photograph, covering three quarters of the opened book, which shows an elephant performing an action. A soft peach column is the background for the accompanying text which describes the action and the reason. 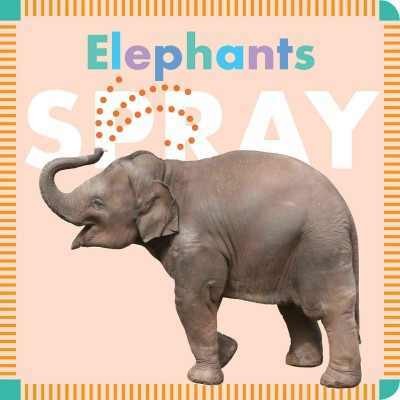 An elephant walking through the forest with trunk lifted high is accompanied with the text "Sniff, sniff!" in large, white text and in smaller letters, "He smells food." The book is a simple, sturdy square and the soft colors are offset with simple designs of squares and small stripes. This is part of a series featuring animals performing various actions, including lions, dolphins, monkeys, and more. There are also sets with machines and farm animals. My one quibble is characterizing the animals as "he" - that seems to be the default in board books and picture books featuring animals and it's unnecessary (and often inaccurate) but hopefully the other books mix it up a little. Verdict: Affordable, sturdy, developmentally suited to infants and toddlers, this and the other titles in the series are a great investment in your board book section and will fill your shelves nicely. I'm usually skeptical about first day of school books, or books that use heavy-handed metaphors to show tolerance and diversity. But this one just really clicked with me, for some reason. Anya wakes up on what seems to be a normal day. But it's not. Somehow, she has....A TIGER TAIL!! Of course, it just has to be her first day of school! She tries everything she can think of to get rid of the tail or get out of going to school, but there's no escape! She's frozen on the sidewalk when the bus pulls up, the kids jump out and....she runs into another kid. With bunny ears! Hmmm, the next thing she knows it's time for a class picture - and she's not the only one who's just a little different. Boldt's colorful, digital illustrations are cheerful and attractive. Curly-headed Anya and her fuzzy tail are cute and her classmates are a diverse group, sporting everything from sensory headphones to koala ears. From a purely adult viewpoint, this isn't likely to really introduce kids to tolerance and diversity. It would take an adult to draw the connection between the children with real-world differences - physical abilities, skin color, etc. and the fantastical additions of animal tails and ears. There's no explanation for where Anya's tail comes from and her parents' lackadaisical approach is odd. 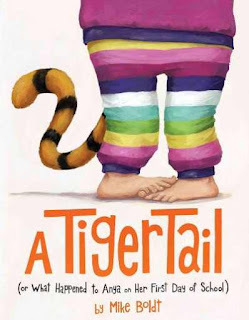 It's also somewhat odd that the author seems to be drawing parallels between kids who apparently wake up one morning with an animal appendage and those with cultural, racial, or physical differences. Verdict: But for a book meant to reassure kids about being different or sticking out there first day of school, it works just fine. It's funny and sweet and kids are unlikely to think that deeply about it. Not a first purchase, but if you're looking for additional school-themed books to reassure first-timers this is a nice additional purchase. Also, I just like tiger tails. I've been looking for new space technology books for the past few years, ever since I weeded most of our titles from the 80s (please don't ask me about the 90s). Unfortunately, it seemed like space had had its moment and no new titles were being published. So I was delighted to see this new series, focusing on space technology, from Pogo. I was sent Space Stations for review and it was exactly what I've been looking for. 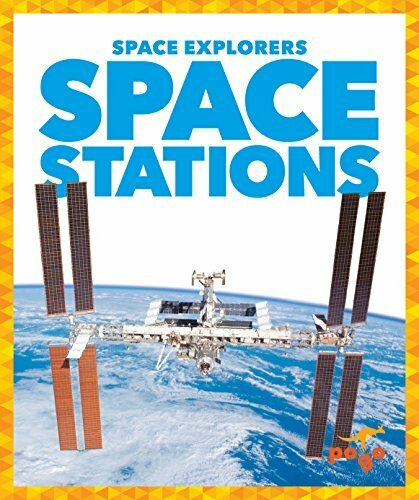 In a few chapters the book covers the basic definition of a space station, several historical stations, and the International Space Station. There is a glossary, index, and activity in the back. The series includes titles on rockets, satellites, rovers and spacecraft. It's intended for grades 2-3 and has a limited amount of text and lower level reading but enough information to interest the reader. Verdict: If, like me, you are looking to update your space section this series is just right. In part 2, we move materials and computers and set up new furniture. We had to get someone out from our consortium headquarters to fix the data jacks - they were originally made to have one internet data jack and one voice/phone jack. Why I do not know. One of my colleagues helped me haul the unwieldy and rather filthy desks and computers around and then our consortium IT person fixed the jacks. Then we (well, mostly my colleague who is awesome) crawled around on the floor to reconnect everything. I vacuumed and wished I'd brought a clean shirt to change into. This is now the "official" teen lab. All two computers of it. This is supposed to be the area for teens who want to study or talk quietly. We have all our soft seating back in this area, four tables (they fit together to create two big tables) and 12 chairs. We'll be able to have programs and after school activities on these tables. See the nice tables? And the kids are enjoying stacking cups. You can't do the actual cup stacking thing with dixie cups, incidentally, because they squish, but you can build towers with them. We moved all the ya audiobooks upstairs to the adult audio room. It's mainly adults who listen to them and we had run out of space, especially since I had a batch of playaways donated by the school library. We spread the graphic novels out to have more display space. Our graphic novels don't circulate as much as I would like, but maybe the new display area will open it up. So, there it is. Now all we have to do is use it! something with cornstarch and soap? Those are not my hands, incidentally. My desk has the Mondays and so do I. I am feeling a little overwhelmed and a lot frazzled, but I did not actually bite anybody and while some of my staff are tiptoeing around me a bit, I had previously provided chocolate so it will be ok. This weather is making me sick - I mean that literally. Cold enough to release cedar pollen, dry and warm enough for it to hang in the air. I am miserable. Although, when I have continuous sinus headaches for days, I remind myself that I am fortunate not to suffer from migraines. Large group at book club, even though they weren't actually interested in talking about the book club books, just spreading glitter and enthusing about Harry Potter. We got the teen computers moved, reconnected, and running, thanks to my colleagues! I used the materials from my outreach storytime and a few extra books from my professional collection. I started with three very young toddlers, who didn't quite get it, and ended with 4 older kids who didn't want to stop! We cleaned up, finished projects, and Jess put furniture together. The teen area is almost done! The adult department had a Valentine's program "art and love songs". This was originally planned for last Thursday, when I had Lego Club (and before V-Day). But things got changed around, so it was today instead. 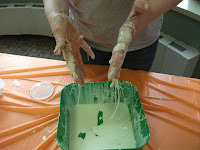 This was a bit tricky, as I had Mad Scientists Club and it was super messy. Fortunately, all the staff worked together and it worked. We both had a great turnout and the adults kindly overlooked the stains on the floor that I didn't have time to clean up because they wanted to get started right away! I stayed for the evening and opened the storyroom with crafts for any kids who wanted to hang out while their parents were being all romantic. I started early to take our cushion covers to the cleaners. Last outreach storytime for February. Spent about an hour alternately vacuuming, scrubbing, and cleaning the carpet. Note to self - that combination of ingredients sticketh like a....sticky thing. Determined assault on desk, including more holds for school projects, paperwork, orders, and finally cleaning up all the toys with missing pieces. Finally left an hour late. Now it's time for VACATION. Ordering replacements and putting together all the pieces of toys left in my office. You can see new toys at my Read 'n' Play blog. A lot of kids are reading Battle of the Books titles. Rain Reign by Martin is a favorite. They're also reading Wonder, one kid is reading Warriors, and several are getting into Harry Potter. Other books mentioned include Detectives in Togas and American Girl books. Several enthusiastic fans of Bird & Squirrel. One requested all the sequels. A couple kids read Dealing with Dragons but they're more into Harry Potter right now. Our nonfiction - Hatshepsut and Fatty Legs - were read and enjoyed but the girls weren't feeling chatty. Finally got a couple kids to take Melonhead. Nobody wanted Robe of Skulls though. Owen is a complete bookworm (dragon-worm that is) and is perfectly content to sit at home in the stone house, reading while he waits for his fiery cold to go away. However, his twin sister Ella is much more adventurous. She thinks a cold that makes you sneeze fire is not normal and they should find a wizard to cure it. Owen isn't so sure - evil wizards (and vegetables) are top on his list of things he is scared of. Not to mention his worst fear; evil wizards made of vegetables! However, Ella is persuasive and soon the two are off on an adventure, bickering and bantering along the way. They make it to the Cave of AAAAAH! Doom! but will they ever make it out again? This silly and icky beginning chapter book is generously illustrated with black and white drawings. I could only get a sense of them from the sketches in the ARC, but going by the cover they look delightfully goofy. Gross details like a spider-snail pet, eating slugs, and stinky fish ice cream are mixed with wacky humor, including an evil vegetable wizard. Verdict: I'm always looking for new beginning chapter series and I think this one, a fun mix of gross and silly, will be a welcome addition to our collection. Fans of Branches' Notebook of Doom are sure to approve. Little Bee's forays into beginning chapter books are looking good! Recommended. Captain Quirk, a self-confident but foolish sea captain, is delighted to be chosen by the king to explore the mysterious outlands. 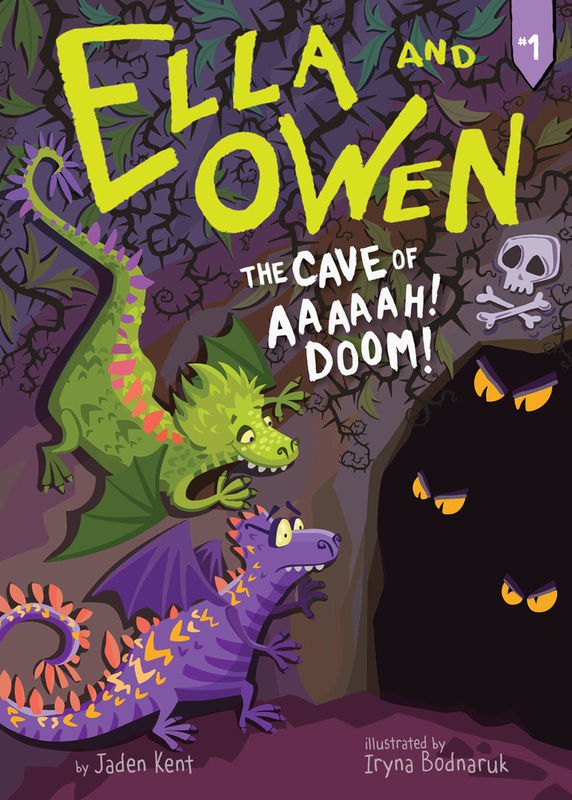 Along with his crew they have an easy voyage… until fearsome monsters attack! 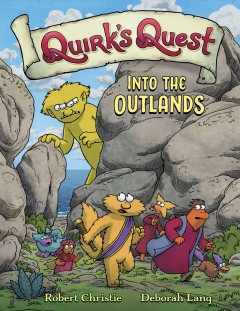 Stranded, with only a few crew members left uneaten, Quirk and his crew encounter a strange sorceress named Hukka, a group of friendly local creatures, and prepare to set out on a journey farther into the outlands. Along the way readers are introduced to the remaining crew members, the some of the secrets held by Hukka, and hints of darker things to come. The creatures populating this story are very reminiscent of Muppets. In fact, they look exactly like Muppets with legs. They are all various incarnations of furry creatures, all with bulging eyes and a variety of skin and fur colors. A few, Burtrym the ecologist and Cleus, apprentice healer/botanist, walk on four legs (Cleus is similar to a centaur). Each new day of their journey is introduced by the captain’s log and readers will quickly realize that Quirk is immature and ineffectual while most of his crew are obsessed with their scientific positions and particular interests. Only kitchen assistant Smok has the practical skills and knowledge needed to survive and he humbly offers his assistance without seeming upset that the rest of the crew take him for granted and continue following the vainglorious captain. The captain’s log is also written in cursive, which will throw off a lot of younger readers who no longer learn this in school. On the one hand, it’s an interesting and exciting adventure with a promise of many new adventures to come, secrets and dark doings. On the other hand, there are a LOT of characters and although they all look very different, I found it almost impossible to keep them straight. The locals, the Yoons, are cheerful, indestructible, view everyone as their friend, and have no power structure. They also speak broken English and their behavior is very childish. There’s a calm disregard of the deaths first of most of the crew and then of the interchangeable frog army throughout the book. Although it’s implied that the captain and his choices are foolish, the crew all works together to let him think he’s in charge for no real reason. Verdict: A fun and exciting adventure with a lot of troublesome undercurrents in the story. Interesting to discuss perhaps and may appeal to Bone fans but I’d wait and see if the second volume fleshes out the characters and problematic plot points more before purchasing it. This board book adaptation of a 2014 picture book hits all the right spots; no surprise since Joyce Wan is the queen of cuddly and cute. Simple rhymes encourage the readers to find all the "sleepyheads"; cozy animals tucked up in holes, on the water, in caves and in trees. But where is the sleepyhead in the bed in the house? The book reiterates the previous couplets and then ends with the sleepyhead - a baby asleep in its mother's arms. 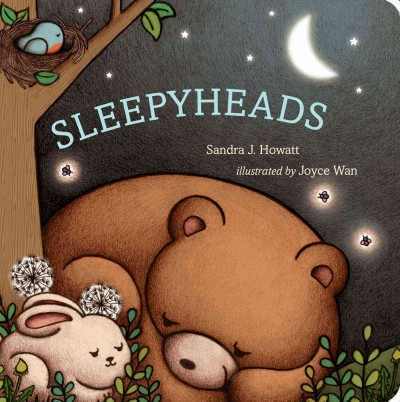 The text is simple enough to lull infants and toddlers into a sleepy mood or interest them in following along with the book. My personal interest is all in the sweet illustrations. I love Joyce Wan's gentle curves and soft colors, which give a feeling of fuzziness on the page. An adorable round bear, little blue bird, sleek otter, and cuddly baby are all sweetly pictured against the gentle, grainy grays of the night sky. There are details for older children and adults to coo over - the starry dandelions, delicate water lilies, and sparks of fireflies. However, the art is simple enough for younger babies to still be able to focus on the larger aspects and bold lines. Verdict: We love Joyce Wan's board books at my library and Howatt's text meshes perfectly with her cozy art. Even if you've already purchased the picture book, I recommend adding the board book to your collection. I hadn't associated Camille Garoche with Princess CamCam, author of the beautiful Fox's Garden, but the lovely paper cuttings immediately gave me a clue. Two sisters are watching the snow in a wonderful, moonlit world. One goes outside and creates a snow rabbit, which she brings inside. Only then do we see her sister is in a wheelchair. They both venture out to explore the snowy world, but the second sister's wheelchair gets stuck in the snow. 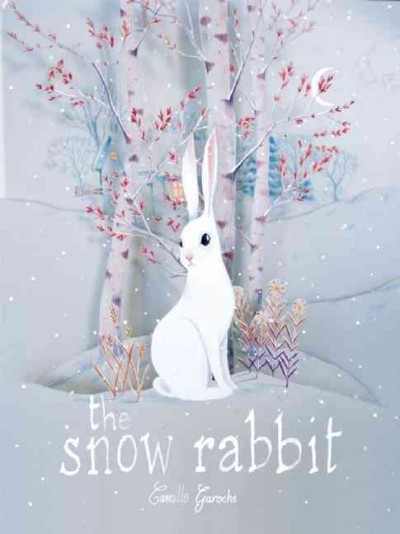 Alone and frightened, they think they are lost in the woods but the snow rabbit they set free returns, more magical than ever, to rescue them. Garoche's delicate, three-dimensional cut paper illustrations are so, so magical. The reader feels like they have drifted into a silent, snowy world of moonlight and magic, where anything can, and will happen. The sweet, wordless interaction of the sisters is beautifully conveyed in their gentle care for each other and their delicate movements. Verdict: So, so lovely. 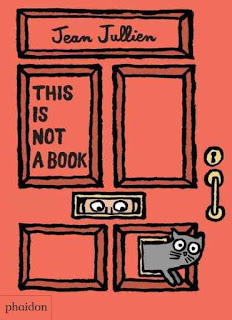 If you buy only one wordless book this year, make it this one. These two new titles in ongoing series show what Bullfrog does really well - high interest topics, excellent photographs, and simple text. Books like these are what make Bullfrog a popular series for both patrons and teachers in my library. 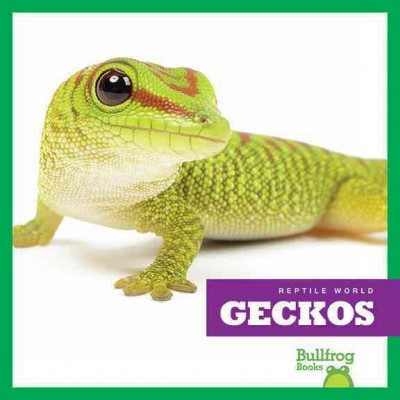 Geckos is a new entry in the "Reptile World" series. The book opens with the most memorable fact about a gecko - when it loses its tail, it grows back! Further facts are included; the sounds a gecko makes, its sticky toes, and reproduction. Back matter has a labeled photograph of a gecko (Parts of a Gecko), picture glossary, and index. These are perfect for younger kids who like nonfiction titles and for beginning readers wanting to read on their own. The photographs are bright and attractive, the text simple but informative. 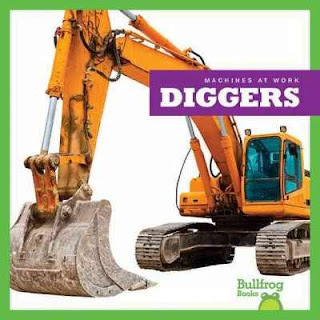 Another popular series at my library is "Machines at work" and I received a copy of one of the new additions, Diggers. Of course, machines are always a popular subject for young children, but how often do you find nonfiction that is at an easy level, includes photographs, and represents diversity? All of these make this a go-to series in my library. This particular title shows a dark-skinned man, "Ed" operating an excavator and a curly-haired woman "Amy" driving a backhoe. Both are shown in action operating different parts of the vehicle and digging holes for different construction projects. Back matter includes a labeled digger, picture glossary, and index. Kids fascinating by machines collect these off the shelf in piles, delighted to find books that fit comfortably in their hands and which they can often read themselves. I love to hand these to my construction-fan girls, knowing they will see women represented equally. Verdict: These show the best of what Bullfrog offers; accessible, sturdy, and easy books for young children and beginning readers to devour on popular topics. I strongly recommend both series. All alooooone. People were sick or had time off or were working at home. I mean, I was not LITERALLY alone, but my cohorts abandoned me. Long staff meeting. I did Toddlers 'n' Books for Pattie - I used my outreach storytime and then threw in little puppets to go with the "walking, walking" song. Large groups at both sessions (relative to the sessions), lots of new people, several screamers. I always figure that's how you know they're having fun, if they scream when they have to leave! Large group for Bookaneers with several new kids. Jess did the parts of the obstacle course we didn't do last week - activity stations. Now I'm sick. I warned the kids and they hugged me anyways. More bills, sorting books, and started working on a big remote collection project. I'm trying to decide if making book lists for these projects would be helpful or a waste of time. Very busy. I managed to only cough on a few people. I worked for about three hours - got my desk partially cleared off, cleaned out some paperwork, and some performers booked. Then I went to Walmart and bought supplies. This was Pattie's big Valentine's party - I worked the desk and lent her an aide. It was very busy. My main project this week was putting together a huge remote collection (about 400 books) for a teacher doing inquiry projects for several full grades. I have been selecting, placing holds, and processing boxes and boxes of books, helped out by our circulation staff! Three kids liked it, thought it was funny. One 3rd grader said it was too long. Kids said they liked it but didn't have much to say except one 3rd grader that it was too short (yes, same person as above). Thrilled reader found a sequel to Gold Medal Mess which we just read. Very excited. In a small, run-down city zoo the hippo waits eagerly for his friend Red Panda to tell him stories of life in the big city. One day, Hippo decides he can't take it any more - he's going out to live in the big city and get a job like Red Panda. 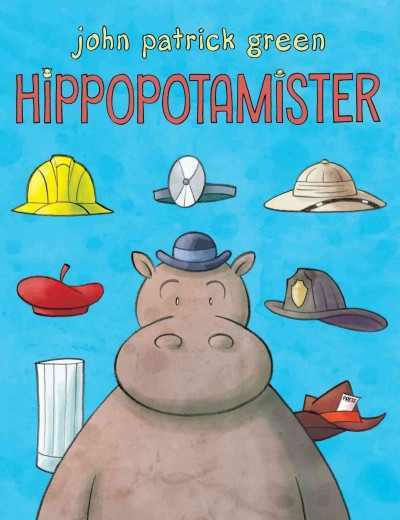 Of course, he'll have to be a hippopotamister to live in the human world! However, it turns out that Red Panda has, perhaps, exaggerated a little about his careers and Hippopotamister wonders - will they ever find a job where they both fit? The text is mostly in speech bubbles while the real story goes on behind the words, in the art. Cinematic, bold and cheerfully colored, kids who look closely will see the contrast between what Red Panda says and what is actually happening and will cheer when Hippotamister finds a place where both he and his friend fit in, as well as using all his new skills. This seemingly simple story has both humor and heart and an underlying message about confidence and making choices. While readers can certainly enjoy it as a fun story, it would also spark great discussions about friendship, doing things for yourself, and the dynamics between the two friends. Verdict: A fun addition to your graphic novel section for younger readers. Recommended. and started laughing uncontrollably. Is this fine literature? No. But it's exactly what I needed and, dare I say it, what kids will love. Sam is just your average, unpopular kid. 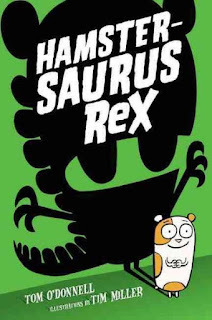 When a hamster suddenly appears in his class, he quickly whispers his name suggestion, "Hamstersaurus Rex" to his best friend Dylan (she's more popular than he is, even if she does go on and on about disc golf a lot). Then the hamster disappears. The story doesn't end there though - throw in some strange vitamin drink, an overnight mutation powered by junk food, a bully with plans for the world's best (or worst) swirlie, and the Little Mr. (or Miss) Muscles Contest and nothing is certain! This is just pure funny. Jokes, puns, stereotypical bullies, quirky teachers, and, of course, a mutant hamster, are all dumped into the book for one fast, fun read.There are enough goofy illustrations to please notebook novel fans but not so many that parents will balk at picking up a "graphic novel." The humor is mostly clean and there are good friendships, consequences for behavior, and strong (literally) female characters. Verdict: Add it just for fun! I'm always pleased to find new hamster books, because of our library hamster, and this is sure to delight fans of Captain Underpants, Andy Griffiths, and anyone who thinks mutant hamsters are awesome. Hmm. This is a very different board book. As the title explains, it's not a book - each spread turns the book into something else through the clever use of illusion in the art. As you turn the book in different directions it turns into different things. The first spread shows a wide mouth, complete with sharp teeth. The next spread turns the book into a computer screen. Then the book is a tennis court, then a refrigerator, a cozy chair for reading, and a butterfly. Then it's a naked bottom. Um....yes, that's what it is. Ok, moving on. A piano and music, children on a stage, a tool box, a high wire artiste, and the penultimate spread opens out to create a larger spread with the cat on the front page entering the house. The final spread shows hands that clap as you close the book. This is unique and elegantly done and the concepts are interesting. It will make readers think about perspective and how it changes what you see. But does it work as a board book, for ages 0 to 2? I'd say no. While the art is interesting and the perspective unique, it would take an older child to fully appreciate the changing perspective and the illusions the book creates. Verdict: Phaidon creates unique and interesting artistic experiments in their books. This one will certainly appeal to adults and older, more sophisticated children, but it misses my own library's audience for board books which is much younger and aimed at introducing infants and toddlers to the basics of conventional print. Astro is just fine in his own orbit with no intruders, thank you very much. But then a satellite gets closer. And closer. And oh no! Astro is off on a crazy journey. Will he survive the giant SMASH! that awaits him? 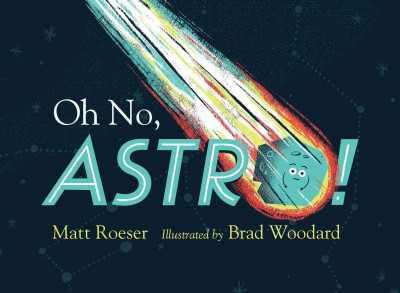 Back matter to this fun picture book includes a series of related space facts and information about asteroids as well as a few suggestions for further reading. The art is bright and eye-catching, with lots of sharp edges and splashes of color against the blackness of space. Astro zips merrily through the cosmos with a flaming trail of fire (and lost belongings). This was hilarious and I loved it! There are so many ridiculous jokes that I giggled through the whole book, from Astro requesting that "his personal outer space...be respected" to his wail of "I don't like confrontation!" as he whizzes towards the earth. 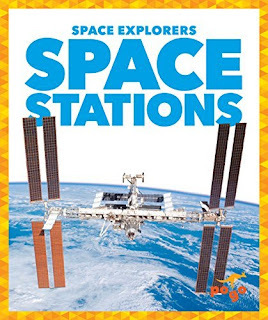 Cheerful, bright pictures, lots of funny jokes, and a useful compendium of back up facts make this the perfect book for space storytimes or kids interested in space. Verdict: Funny, informative, just the right length, and all together delightful. I also appreciated Nova, the little girl who's clearly on her way to be a scientist. Recommended. I've liked most of the books I've seen from Jump/Bullfrog so far and I appreciate getting samples from new series so I can assess them for my library's use. I was interested in these, since I'm going to be updating my 900s this year. "Hello, America!" covers different American landmarks and the title I was sent for review is Ellis Island. I'm going to say up front that I don't care for it and won't be purchasing this series. I think there are some subjects that can work for younger kids and some that need to be introduced when they're older and can appreciate the complexities and this is one of them. 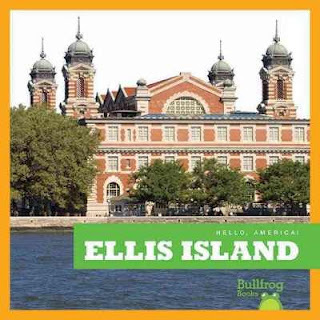 The opening title page has a picture of the signboard of the Ellis Island Immigration Museum. This is the only mention of the fact that Ellis Island if now a museum. Black and white photos show European immigrants arriving at Ellis Island, being checked for health, showing their papers, and then a picture of contemporary kids at the end accompanied by the text "America is our home!". There are four pictures of sites at the museum and a brief picture glossary. There are some major issues with this book. Contemporary photos of museum visitors are mixed with old black and white photos. Adults will understand the difference, but many kids will not. The contemporary kids are diverse, which is extremely misleading - no mention is made of Angel Island (where most Asian immigrants entered the United States), slavery, or the border between the US and Mexico and yet kids whose ancestors may well have experienced all of these are pictured. The book doesn't have scope to mention the complexities of the USA's history of immigration. The upbeat text, paired with the pictures of clearly frightened and miserable immigrants is disconcerting to say the least and no mention is made of negative experiences, prejudice against European immigrants, or what happens to the people without papers or who were unhealthy. This topic is simply too complex to be introduced to young kids in this simplistic format. If the book had focused solely on the museum and left out the pictures of contemporary kids and black and white photos it might have been better. 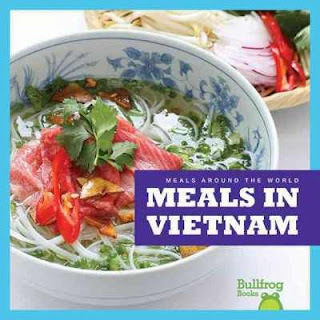 The second series I'm looking at, "Meals around the world", is a little better but still not something I would recommend. I was sent Meals in Vietnam for review. There are several pages under the "Street Food" section including pictures of a street market, "Kim" eating pho, a boy named "Duc" eating rice noodles and an unpictured person named "Hue" eating summer rolls. An unpictured girl named "Mai" eats rice and vegetables. A woman named "Cai" sells banh mi. A spread showing a family at home? In a restaurant? pictures them eating rice, meat, fish sauce, and chuoi chien. It says they bought the meal, the implication being they purchased it in the previously shown street market. However, the background of where they are eating and their clothes seems to be a suburban American home. The back matter includes a recipe for Chuoi Chien, a picture glossary of the foods mentioned, and a brief index. There is no pronunciation guide for the food names and there are no sources. I am most concerned that random people and names were matched up in the photographs. There's nothing to say the people pictured actually answer to the names given them. Again, this topic needs more scope than can be provided in a brief, easy reader. Verdict: While I appreciate Jump's effort at adding diversity and covering many different topics, I think these series are not suitable for the limited scope of their Bullfrog imprint. Not recommended. No programs. Lots of work. For some reason I am very stressed this week. Some weeks are just like that. Lots of coughing. I was wrong about my assessment of Guess Who, Haiku - it is NOT too easy for the kids. My beautifully relaxing three year old class made me so happy. They just want me to read stories. A better turn-out for Lego Club - 39. All our teen furniture has arrived, but we have to change the computers before we can install it. Off-site at the middle school. I collected vast amounts of supplies, Legos, and assistants and we made goo, talked to people, distributed calendars, and dyed kids pink for about 5 hours. Then back to the library to unload and finally home! Bold, active Cleo and her friend, shy, timid Evan, are very upset that their favorite librarian is gone. Ms. Hilliard has been replaced by mean, unfriendly Ms. Crowley and Cleo suggests something mysterious is going on. 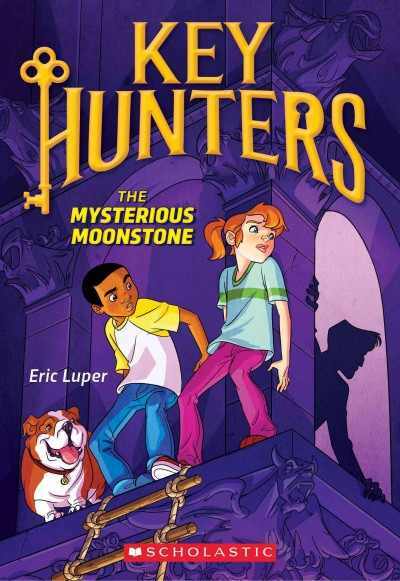 Evan scoffs until they discover a huge underground library and a magical key. It takes them back in time to Victorian England where they help a teen detective solve the mystery of the mysterious moonstone, a cursed jewel. Along the way they discover the meaning of the magical keys, some of Ms. Crowley's secrets, and the fate of Ms. Hilliard. Black and white illustrations show dark-skinned Evan and exuberant Cleo transformed into Victorian dress and dropped down in the midst of a Sherlock Holmes atmosphere, including a mysterious Indian butler named Kumar. On the one hand, this is a fast-paced mystery that kids will enjoy. It looks like the two protagonists will be traveling through history a la Magic Tree House and encountering various mysteries along the way. On the other hand, I thought the story was badly written. The writing was choppy, the dialogue stilted, and the characters stereotyped. Events happen and characters appear with little explanation or backstory. Additionally, there are some glaring historical anomalies - yes, it's a fictional story, but a girl and a dark-skinned boy couldn't just walk into high society with a teenager (why is Watson employed by the police anyways?) without a lot of questions and consequences. While I like the effort to add diversity to beginning chapter books, I don't like it coming at the expense of historical accuracy and whitewashing the treatment of minorities and women in the past. Verdict: I'll keep looking for other chapter book series to offer my readers. I think time travel fantasy should be more historically accurate. Charles is not happy about moving to the big city. He'll have no friends, his parents are making him eat weird food, and basically everything is different. On top of all of that, there is an ACTUAL MONSTER IN HIS CLOSET. No, not a pretend one. A real one! 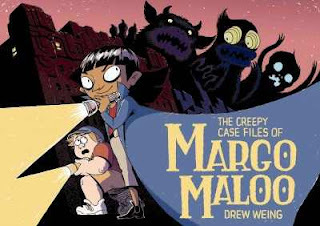 Fortunately, a neighborhood kid drops a hint - Margo Maloo is the girl.... er.... person? to call. She turns out to be a very strange.... creature? and not at all what Charles expected. But now that he's had a glimpse of the monster world he can't get enough and he's ready to take any risk to follow up and get the scoop for his blog. Drew Weing's art is attractive, clear and simple without too many details or too boring. It was also strangely familiar and then I realized that he's married to Eleanor Davis, who has a similar style which I love. Ah, Secret Science Alliance, where is thy sequel? I would have like the black kid to not be (once again) the sidekick, but Margo is certainly diverse enough for anyone's taste. Is she monster or human? Or both? She's a woman of mystery. I really enjoyed this spunky mystery. 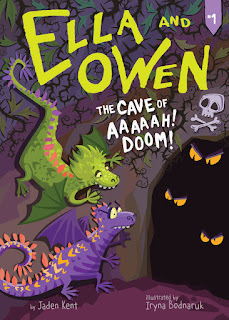 It's got the perfect mix of mystery, monsters, adventure and humor that will make kids read it from beginning to end. Verdict: There's hopefully a sequel in the works for this monster mystery. If you have any fans of Kiki Strike they'll devour this graphic novel; otherwise, promote it as a perfect book for lovers of the slightly macabre and mysterious. Educational board books seem to be the wave of the future. So how does this one measure up? I first saw it at a conference and it looked fun enough that I purchased it for the library. It's circulated quite well for us so far too. This book is a colorful introduction to the solar system. It starts with the moon and sun, then goes on to name all the planets with a simple fact about each - venus is the brightest, etc. Secondary facts are written in smaller type. The book finishes up with stars and comets. 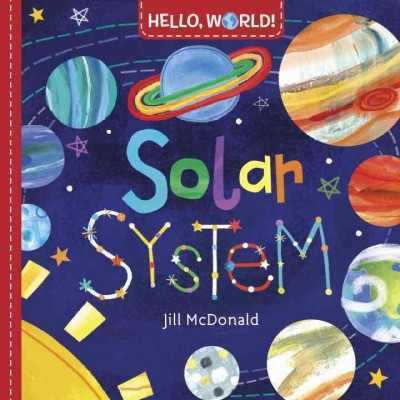 The book is simple enough for a preschooler to understand, but the solar system is, in my opinion, too complex, a concept for a board book audience. While the colorful, splashy art is enjoyable to look at, this age is not likely to connect a picture of saturn with rainbow colored-rings with a planet they can't even see in the sky. Verdict: This fulfills the many requests I get from parents for "educational" board books, but it's not actually going to teach kids anything, in my opinion, because it references things they can't physically see or are too young to conceptualize. Still, it's attractive and older preschoolers will enjoy it. I don't regret purchasing it.